Women's Original Waterproof Rubberized Hunting Coat is rated 4.6 out of 5 by 9. Ce manteau de chasse caoutchouté polyvalent allie une protection tout au long de l'année et un design élégant qui convient à tous les styles de vie. Hautement imperméable, ce manteau pour femme, fait de polyester tricoté enduit d'un revêtement en caoutchouc doux, possède des coutures soudées. Une fente au dos et une doublure en maille assurent une bonne respirabilité quand il fait chaud, tandis que le capuchon et les poignets réglables offrent une étanchéité à toute infiltration indésirable. Capuche ajustable avec boutons-pression pour protéger du vent et de la pluie. Rated 4 out of 5 by Anonymous from Excellent Craftsmenship Stylish design and duarable quality that will last through the years I can't wait for it to rain to wear it. Rated 3 out of 5 by alice from Bulky & distinct smell of rubber Had to return this. Two major flaws. It gives off a distinct smell of rubber (which did not dissipate despite being aired on a hanger for days). Second, it is absolutely immense. I bought an XS (normal size), fits more like a Large. It felt like I was getting into it rather than putting it on. Rated 5 out of 5 by Clementine from Excellent quality This raincoat is not only functional but great looking. Keep in mind this coat fits large, so go down in size. I ordered an XS but it was too big. I had to return it and get a refund because they were out of XXS. I was so disappointed. Rated 5 out of 5 by Huntergirl100 from So adorable! This jacket is so soft and squishy, not stiff at all, I am 5 ft tall but only needed to flip cuffs back and looks perfect, length lands just above the knee, I daresay I look as good as her majesty! 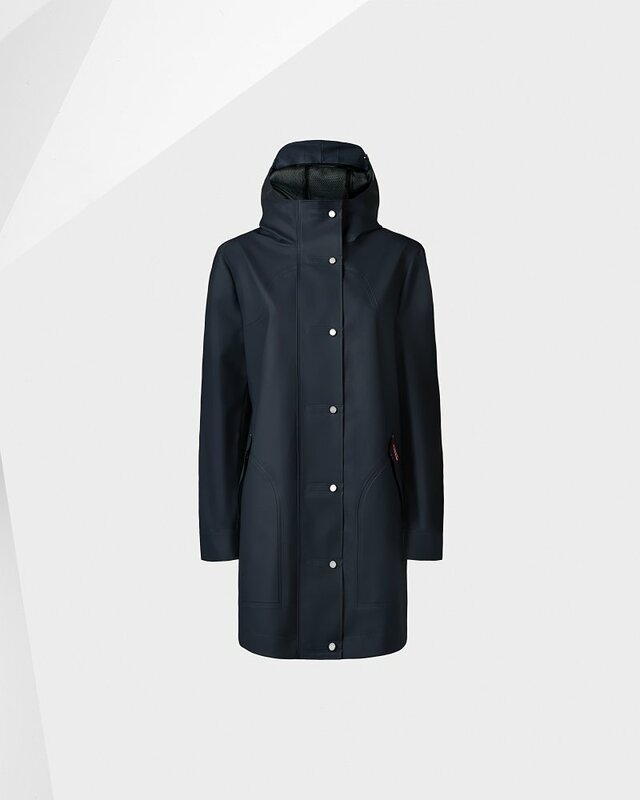 Rated 4 out of 5 by Jayb from Almost perfect Well made rain coat. I have 3 different color hunter rain boots and i got white coat so goes well with any color. Perfect for rainny Vancouver winter. Except it has some sort of black mark inside of side neck area, and wish they had xxs size. Rated 5 out of 5 by Neema from Good for rainy days! Color, material everything is better than I expectes. It’s bigger than I thougt. So If you wear ‘medium’ size for other cloth, you have to order ‘small’ size for this. Rated 5 out of 5 by Sara from Certainly keeps you dry! Purchased this coat during Hunter's Black Friday sale and am very pleased with the product. This coat will most certainly keep you dry on a rainy day, but it is not warm, so be sure to wear a sweater with it if it is cold out. I read the previous reviews and decided to size down (I'm 5'3" and about 135lbs; I normally wear a Small but went with the XS) and I'm glad I did. After reading one review, I was initially concerned about how much arm room I would have if I sized down (my arms are a bit wide), but it worked out just fine. The coat fits very well and I can easily wear a thicker sweater on under it. Rated 5 out of 5 by Marathon10 from Great colour and fit Bought this a couple of weeks ago, but have not yet had an opportunity to wear it. Definitely a "pouring down with rain" coat, and I have every confidence - based on the many purchases I have made from Hunter Boots - that I will be delighted with it. The zip is a little stiff and awkward, which is probably a consequence of being brand new, as well as the material from which it is made, but I am sure it will become easier once I start wearing the coat.